Identifying objects and assigning responsibilities to these objects. Objects communicate with each other by sending messages. Messages are received by the methods of an object that in return process the data. Java, C++, Python, Ruby, Visual basic.Net etc are languages that support the concept of object-oriented programming. A class is a template which contains attributes and methods. Basically, a class is set of similar entities. For Example, a class Rectangle can have attributes length, width, height, etc and can have methods toCalculateArea() etc. Inheritance is basically a parent-child relationship between the two classes. A parent and child class hold IS-A relationship. A parent class holds the general properties which are inherited by the child classes whereas subclass also has its own additional specific properties as well. When we create an object of child class it gains all properties of the parent class. Polymorphism is the ability to appear in many forms. Polymorphism gives us the benefit to process objects differently depending on their data type and class. It is known as compile time polymorphism. Static polymorphism is basically method overloading. It gives permission to have more than one method having the same name but with different parameters or a different number of parameters. The compiler knows at the compilation time which method to run. It is known as runtime polymorphism. It is basically known as Method Overriding. The compiler decides at the runtime which method to run. All subclasses of the base class have the method with same name and parameters. JVM decides the method of which class to run at the runtime. Abstraction means mention important features without including background details. For example, while driving a bus you do not have concerned with its internal functionality, you only concerned with gayer, accelerator, wheels, steering etc. This type of data is put into the abstract class and concrete class is build by following the abstract class. Encapsulation means wrapping the data. Encapsulated data of the certain class will be hidden from other classes. To achieve encapsulation in java, declare the variable of the class as a private. Provide public setter and getter method to modify or view the values. We can use the setter-getter method to access age and name. An interface is like a contract which is agreed by a class in which a class implements the methods of an interface. An interface is a sort of abstract class in which all the methods are abstract. None of the method defined in the interface has the body. The syntax of writing an interface is very much similar to that of the class. You write it in a similar way except you specify it as the interface, not as a class. An interface contains method definitions, not method bodies just like an abstract class. An abstract class can also have some non-abstract method body definitions but an interface contains only method definitions. A class does not extend the interface as it extends its superclass instead it implements the interface. A class can implement as many interfaces as it wants. If a class does not provide the body to every method of the interfaces it implements then it becomes an abstract class. You cannot create an object of that class. 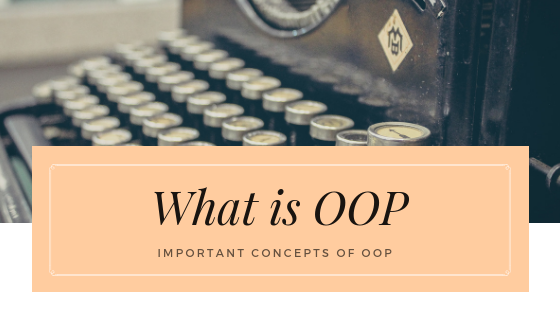 Note: If you want to become a good programmer than it is necessary for you to have a good command of OOP. Object-oriented programming has many applications such as client-server systems, object-oriented databases, Real-Time system design etc. So, work hard to get good skill in OOP and do not give up.